Sciatica is a condition that is characterized by pain originating in the lower back or buttocks with symptoms felt down one or both legs. It’s known as sciatica because it resembles a condition of the sciatic nerve. This nerve is a large collection of nerve fibers that originate in the lower back, travel down the back of the thigh and calf, and extend down to the foot. The sciatic nerve provides brain-body communication to and from the muscles, connective tissues, blood vessels and skin for most of the lower body. Your chiropractor often sees patients presenting with sciatica. Symptoms related to this condition will vary from person to person. The pain may be dull, achy, and diffuse, or sharp, localized and specific. You could feel an electric-shock sensation that shoots down the leg. Or your leg may endure a burning, tingling, or numbing sensation. There are several potential sources of sciatica-like symptoms. The first is direct irritation of the sciatic nerve. This could be caused by lumbar disc-herniations, degenerative joint disease, spinal misalignment, or muscle spasms. Other conditions that resemble sciatic nerve irritation include muscle trigger points, referral pain from lumbar or pelvic joints, diabetes, constipation or tumors. If your back pain/sciatica is making you tilt to one side to find relief, and the pain down one leg hurts more when you cough, sneeze, or strain during a bowel movement, then you most likely have true sciatic nerve irritation. 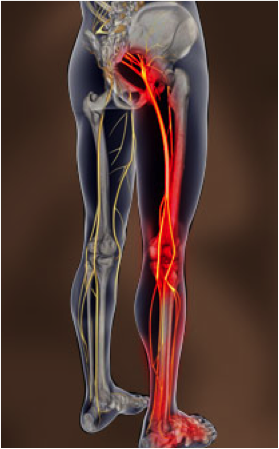 If the symptoms in your leg do not travel past your knee, chances are sciatic nerve irritation is not the main cause. To distinguish true sciatic nerve irritation from other causes of sciatica, your chiropractor will conduct a thorough medical history and physical exam, including neurological tests of your lower legs. Another common test that usually reveals sciatic nerve irritation is the straight leg raise test. When your leg is raised up off the table and your flexibility is limited by the painful symptoms, there is a good chance the sciatic nerve is being irritated in your lower back or pelvis. If these tests are inconclusive, you may be referred to a specialist for further consultation. He or she may request you have x-rays, CT or MRI scans before any treatment is recommended. If it’s determined that your case of sciatica involves the joints and/or discs of your lower back or pelvis, your chiropractor will suggest an initial course of chiropractic adjustments. By applying quick, controlled pressure to the vertebrae in specific directions, your chiropractor can alleviate excessive pressure on the joints, discs or nerves caused by misalignment and/or restriction. Research has consistently shown that people with low back pain can significantly benefit from chiropractic care. However, it may be difficult to treat the problem with chiropractic adjustments alone, so your chiropractor may recommend other health professionals or techniques to help. Massage therapists are skilled at providing relief from tight, sore lower backs. Physiotherapists are also trained in reducing the symptoms associated with lower back conditions. Some chiropractors achieve excellent results with spinal decompression therapy, which encourages healing of the disc fibers and often results in reduced pain for sciatica sufferers. Recovering from sciatica can be a painful and prolonged process. But in addition to getting treatment from health professionals, there are a couple of things you can do at home to help speed recovery. Ice therapy and nutritional supplementation are often recommended. Applying a cold pack to the painful area for 10 to 15 minutes can sometimes provide immediate relief. Taking Omega-3 supplements can help reduce the inflammation. When it comes to any condition involving the spine, including sciatica, your chiropractor can provide all the advice you need. If you have a history of sciatica or are experiencing symptoms, please contact our location nearest you today and we’ll help you heal as quickly as possible.